The structure of the Earth is described in terms of the three layers - core (inner and outer), mantle and the crust and comments on the dating of rocks and how we find out the structure of the Earth from earthquake waves. 7A The Structure of the Earth - A sort of egg? The Earth is almost spherical and is composed of three principal layers. 7A The three layered structure of the Earth. X is the crust: is the relatively thin and cool outer solid layer of the Earth. The thickness of this upper part ranges from 6km to 100km surrounded by the atmosphere of air W. It is much cooler, harder, brittle and less dense than the other layers of the Earth. The crust is divided into sections or 'tectonic plates' which 'float' and move on the very hot mantle at the rate of a few cm per year relative to each other (for more details see Tectonic plates). This plate movement means that most parts of the Earth's crust are in very different locations from millions of years ago. It should also be noted that 2/3rds of the surface of the Earth is water. The lithosphere consists of the crust and the almost solid upper part of the mantle next to the crust. Y is the mantle: is very hot rock material, it is almost solid, quite rigid, but behaves like 'thick, very viscous plastic' rock and can be deformed. In the mantle there are huge slowly moving convection currents driven by heat from radioactive decay in the metallic core. It is these convection currents which move the 'plates' which float above the mantle. The mantle's 'thickness' is 3000 km (about halfway to the centre of the Earth) and its temperature is usually over 1000oC. The deeper you go, the hotter the mantle gets and the rock gets less rigid i.e. flows more easily. Chemically, the mantle consists mainly of non-metallic silicates with some metal ions. Magma is heated molten rock, from the more 'runny' mantle material and comes up to the surface in volcanic activity or igneous intrusions into and through the mantle. The mantle has a higher density and a different chemical composition compared to the crust. It is relatively cold and rigid just below the crust, but lower down it is much hotter and non-rigid and so is able to flow. Technical note: Most of the heat (~90%) generated in the Earth's interior is fuelled by the decaying of radioactive isotopes like Potassium 40, Uranium 238, 235, and Thorium 232 present in the mantle. These radioactive-isotopes generate heat as they lose excess energy when changing to more stable atoms (nuclides). Z is the core: is composed mainly of iron, nickel and other metals. Its diameter is about half that of the Earth (3500 km radius) and its is very hot and dense. It is believed that the core consists of an outer liquid layer (outer core) and a solid inner layer (inner core). It is the iron core generates a magnetic field through and around the Earth. The overall density of the Earth is much greater than the average density of the rock of the crust. This is evidence that the inner layers of the Earth are made of different more denser materials from that of the crust e.g. the metallic core. The lithosphere is the rigid, relatively cool crust, and the outer or upper part of the mantle. It is split into sections called plates - the base of tectonic theory. 7B The age when rocks where formed? The age at which rocks were formed, in, or on the crust can be estimated in various ways ..
Fossils: As plants and animals evolve, species die out and new ones emerge. The sequence and type of fossils can be worked out and the timescale estimated. Therefore the fossils present in a layer can be used to estimate the age of the sedimentary rocks. This dating method is not absolute like radioisotope studies of igneous rocks but its the most useful for sedimentary rocks. Radioactive isotope dating: This is a more accurate method for dating very ancient igneous rocks. As certain isotopes, with VERY long half-lives, decay to form more stable atoms, there is a change in the isotope ratio of less stable / more stable. This ratio gets smaller, and by knowing the rate of change from the half-life of the more unstable atom, the age at which the magma cooled to give igneous rock can be estimated. For example: potassium-40 decays to Argon-40 with a half-life of 1300 million years (1.3 x 109y). The potassium-40/argon-40 ratio can be measured in an analytical instrument called a mass spectrometer. if 12.5% is left the age is 3.9 x 109 years etc. Age of the Earth: Using this method it is estimated to be 4.5 x 109 years. The radioisotope carbon-14, 14C, is of new use for dating rocks. Carbon-14's half-life is far too small at only 5700 years to be of any use for the geological dating of rocks. 5700 years is not very long in terms of geological time because most rocks are at least hundreds of thousands, or millions of years old, from their date of formation. However, carbon-14 is very useful to archaeologists for dating artefacts of organic origin like wood and bone. 7C How to we get our knowledge of the cross-section of the Earth? How far can we drill into the Earth's crust and mantle? How do we know there is a crust, mantle, inner and outer cores? How can we use seismic waves (earthquake waves) to help us answer these questions? At the most, we can only drill down into the Earth's crust to a depth of 12km, which is not even through to the mantle. Therefore, we must find other scientific methods to investigate the inner structure of the Earth since we can't even penetrate the crust to get to the mantle! When an earthquake happens in the Earth's crust it results in the spreading out of seismic waves. They result from the huge amounts of potential energy stored in the stressed layers of rock resulting from plate tectonic movement. These earthquake waves can be detected all around the world using an instrument called a seismometer. The speed of seismic waves depends on the material they are travelling through, in particular the density of the rock layers. When the waves meet a boundary they may be partially reflected, completely reflected, absorbed, continue in a direct line with a different speed or the waves might be directed and change direction. Because the density of the rock changes gradually in a particular layer, so does the speed of the wave. If refracted, the waves follow curved paths (see the diagram below). However, at a boundary, the speed may change more abruptly giving a bigger change in direction (just as you see with light ray experiments with prisms. Scientists (seismologists) study the properties and pathways of seismic waves to deduce the internal structure of the Earth. From the speed, absorption and refraction of seismic waves scientists have worked out the number and depth of the four layers of the internal structure of the Earth. These seismologists calculate the time it takes for these shockwaves to reach every seismometer around the world and, importantly for a specific earthquake, observing the parts of the Earth's surface where you don't detect the waves. The monitoring and recording of earthquake waves has proved the most fruitful direct scientific probing of the Earth's structure and these seismic shock waves have given us most of the detailed scientific knowledge we have of the total structure of the Earth. Powerful earthquake waves (seismic waves, shock waves) always emanate from the central point of an earthquake, called the epicentre, and they spread throughout much of bulk of the Earth if powerful enough. These shock waves are detected by seismologists who use instruments called seismometers to monitor how long it takes for the shock waves to travel from one point near the earth's surface to another point on the earth's crust. These seismic waves are recorded all over the Earth's surface using seismographs. Scientists called seismologists measure the time it takes for an earthquake to travel from the earthquake epicentre to the detection system - the seismometer. There are different types of waves are not all are detected in particular zones of the Earth's surface. P-waves which are longitudinal waves, the vibrations are in the same direction as the waves. A sort of 'push and pull' effect - compression and decompression vibrations of the rock material. P-waves travel through liquids and solids and are faster than S-waves. P-waves are no different in principle to sound waves. S-waves are transverse, the vibrations are at 90o to the direction the wave is travelling. A sort of 'side to side' vibration or oscillation of the rock material. S-waves can only travel through solids and they are slower than P-waves. L-waves are transverse waves that travel on the Earth's surface moving the ground 'up and down' in a wavelike form. The waves can change speed and direction as the properties of the mantle and core change. The changes tend to be gradual giving curved paths, but sometimes you get more abrupt changes (e.g. from mantle to core) and sometimes a waves is absorbed and stops. So, the behaviour of these waves is very complex but inputting this data into sophisticated computer models enables scientists to work out much of the inner structure of the earth. I hope the diagram and accompanying notes explain the basic ideas how violent earthquakes help us to understand the structure of the Earth. A brief guide to the detailed arguments to follow. P-waves (primary waves) and S-waves take curved paths because of the ever changing density of the Earth's layers producing a gradual refraction effect. The longitudinal P-waves can pass right through the centre of the Earth but due to refraction give two small shadow zones (marked black on the diagram). They travel faster than S-waves. The transverse S-waves are absorbed by the outer core and give one much larger shadow zone (marked blue + black on the diagram). They travel slower than P-waves. Fig 13. 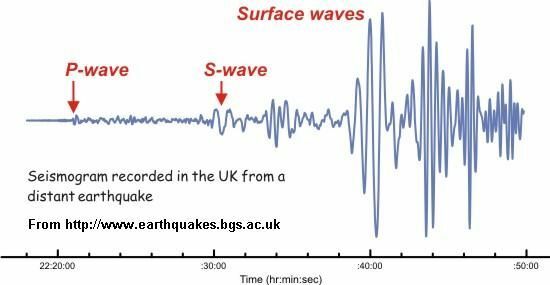 Earthquake Waves, S waves & P waves - study carefully! The P-waves refract as the density changes, and pass right through the core, but the refraction does create narrow P-wave shadow zones which overlap with the S-wave shadow zone. The S-waves can't go through the core, so are not detected on the other side of the Earth, creating a broad S-wave shadow zones. The transverse S-waves cannot pass through the liquid outer core layer - the 'sideways' vibrational energy is rapidly absorbed by the 'soft' layer of the outer mantle. S-waves can only pass through solid or 'nearly solid' layers - the crust and mantle. Fig 13. S and P earthquake waves, shows the paths of two types of earthquake waves (P, blue on diagram) and S, green on diagram) as they travel through the Earth from an earthquake. Longitudinal P-waves can pass through all the layers of the Earth because the 'push and pull' oscillation energy isn't absorbed as easily as it is for the S-waves. The diagram shows the zones on the Earth's surface where the S and P earthquake waves can both be detected by a seismometer (purple zone), AND, just as importantly, where the S and P waves cannot be detected (no S waves can reach the black and blue zones and no P waves can reach the black zone). The reason for these shadow zones is explained below (see also the 'physics' section at the end). BUT, from the shadow zones you can work out the depth of the mantle and the inner and outer layers of the core. Around the world are seismographic stations fitted with seismometers that can detect the P and S earthquake waves and portrayed as a seismogram (seismographic trace). Seismologists monitor the pattern of seismic wave activity and crucially, when the waves meet a boundary between layers some of the waves are reflected. The waves may also change speed as the density changes and cause the waves to change direction by refraction. Within a layer most waves follow a curved path, but the significant deviations occur at the boundaries of the layers. By analysing the reflection, refractions and shadow zones (where no waves are detected on the surface), it is possible to work out the internal structure of the Earth. Seismologists use seismometers to produce seismographs (seismograms) to monitor and record the minute vibrations in the Earth's crust caused by an earthquake. Above is a seismogram, a seismographic recordings of the vibrations experienced in the UK from an earthquake on the other side of the world! You only need to know about P-waves (arrive 1st) and S-waves (arrive 2nd), but as you can see there are other waves and the recording is quite complex! The difference between the arrival times of the P-waves and the S-waves can be used to calculate how far away the earthquake was. From different geographically located seismometer readings you can then calculate where the epicentre of the earthquake was. The main changes in the seismic wave behaviour occur about half-way to the centre of the Earth. It is at this point that you reach the outer 'surface' of the outer core where it meets the mantle. P waves, longitudinal waves, can travel right through the Earth, passing through the mantle and core in the process. Longitudinal waves can pass through solids and liquids and travel faster than the transverse S waves. The wave paths are curved because the waves are gradually refracted by the gradual change in density as you go deeper into the Earth. The refraction and absorption effects causes the formation of zones where one or more of the earthquake waves cannot be detected. The P-waves travel slightly faster in the inner core, suggesting it is solid. S waves, transverse waves, travel through the mantle showing that it is almost solid and certainly not liquid. The transverse S-waves can only travel through solids and are slower than P waves. The S-waves travel through the mantle which suggest its quite solid, but think of it as being a very viscous material, which can melt to form magma in 'hot spots' which can form huge slowly rising plumes of magma. The fact that S-waves are absorbed by the outer core, shows that the outer core is liquid. However, the S waves are absorbed by the outer core and are not detected on the other side of the Earth from where the earthquake occurred, creating the S wave shadow zone (which overlaps with a smaller P wave shadow zones). The absorption of S waves by the outer core proves that this layer is liquid (mainly metal). see physics section at the end. As well as travelling through the crust and mantle, P waves can also travel right through the core layers and be detected on the other side of the Earth. However because of the refracted curved paths of the P waves, there are two smaller zones where P waves are not detected. By collating lots of data from different seismometers around the world on the Earth's crust, it is possible to work out from the speed and path patterns of the P and S wave detected the structure of the Earth, that we cannot in any way investigate directly. The earthquake wave data is put into a mathematical computer model, from which you can get the thickness of the crust and the rocky plastic mantle, the thickness of outer liquid metal core and the radius of the solid inner core of metal. For example, the P waves speed up in the inner core suggesting that not only is the density greater, but that the inner core is also solid. Physics notes and my Fig 13. diagram! The size of the arc created by S-wave detection depends on the size of the core. The size of the arcs of the different shadow zones of the S-waves and P-waves depend on the size of the inner and outer cores. Therefore, from the pattern, you can deduce the size radius of the inner core and the depth of the outer core. So, you can then calculate of the depth of the mantle (plus the crust). P waves, the primary waves, are longitudinal waves and can pass through liquids and solids (blue paths on the diagram). The oscillation/vibration of longitudinal waves is in the direction of wave motion, remember the 'push & pull' of the 'slinky spring' in your physics lessons. This compression and decompression of the material helps retain the energy of the wave and so can pass through liquids or solids (rather like sound can pass through any material). The energy from P waves is much more gradually absorbed by the medium than in the case of S waves. S waves, the secondary waves, are transverse waves and can only travel through solids (green paths on the diagram). In transverse waves, the oscillation/vibration is a right angles to the direction of wave motion and in liquids or 'plastic' material, the energy of the wave is quite quickly dispersed and the amplitude drops to zero, i.e. the wave is no longer existing. This is why you get the shadow zone beyond the liquid outer core below the mantle. In the diagram Fig 13., you should notice all the paths of the earthquake waves are curved. The curvature is due to the waves being continually refracted as the density of the mantle and core changes. This isn't the sharp change in direction you see when light rays are refracted as they pass through an abrupt interface boundary like air/water or air glass. The refraction is more prominent at the mantle - outer core boundary and the outer core - inner core boundary where the density changes the most abruptly. Technically, as with light, when the waves pass into a more dense material they bends towards the normal and when the waves pass into a less dense medium they bend away from the normal. If you look carefully, I think I've just most of the deviations right on the diagram, but the curves are a bit exaggerated! Enter chemistry or geology words e.g. rock type, feature, topic, module, exam board, formula, compound, reaction, structure, concept, equation, phrase, homework question!